It was one of those days yesterday, which admittedly, one can have anywhere. Although I returned to Kazakhstan only last week, the initial excitement of seeing hubby and friends had given way to a dismal Wednesday. I’ve somewhat recovered my equilibrium today; back from a ladies lunch and a market, but yesterday….how I longed to get back on that plane. Trust me there have been countries over the years that yielded more than their fair share of…well in Qatar we all used to call them, Doha Days, and not in a good way. 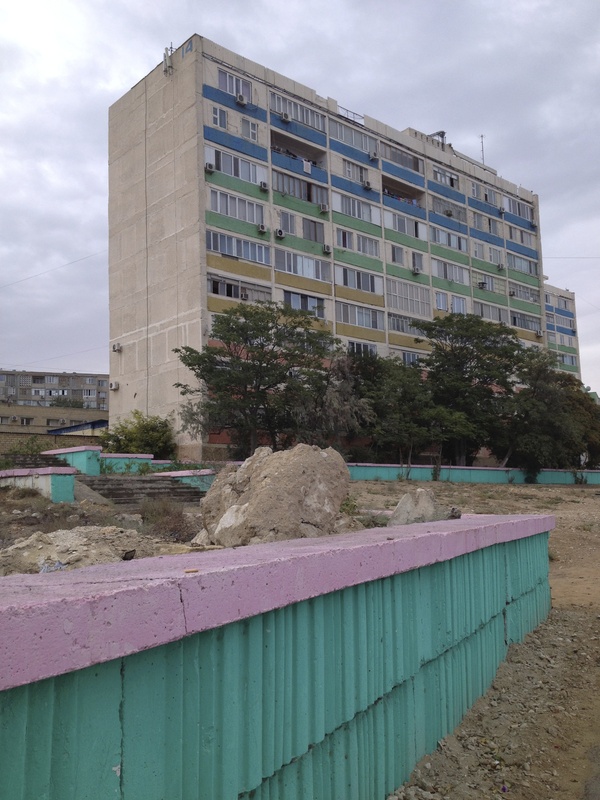 So I suppose yesterday was my first… Aktau Day. I drift back to other countries we’ve lived in. ‘A few moons’ ago in Japan I loved teaching English, though it was definitely a bad day when rats from the upper flat visited us and scurried across the tatami mats and futons. In Holland, gloomy days were easily spun away with a good bike ride through the cobbled streets. Scotland? Too many to mention and that was before the travails of two kids coming down with the chicken pox at the same time. Oman…bad days didn’t exist except maybe when the water was too choppy to take the boat out…oh heavenly Oman! The U.S….the first six months in Houston I was desperate to go back to Oman. And Norway…let’s just say my ‘romance’ with the Vikings and my work cheered me immensely and rescued me from blue days and lashing horizontal rain. 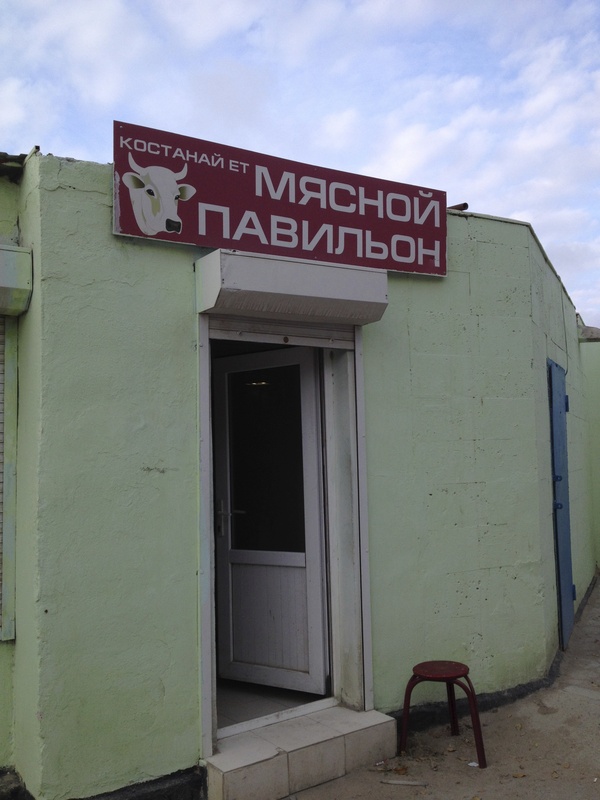 But back to Kazakhstan. 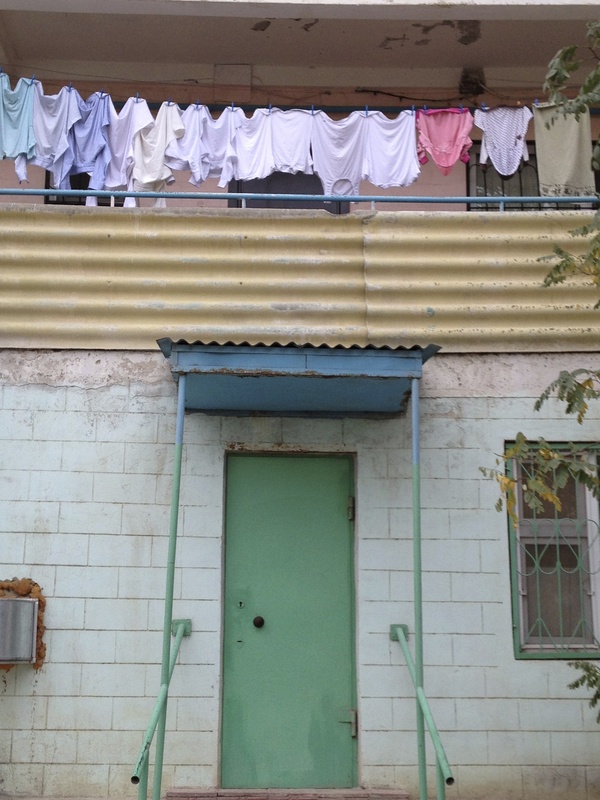 There’s a honeymoon phase when you first move to a country and I revelled in that last fall. But of course, it often doesn’t last. Thankfully at least, my daily routine is calm and harmonious. The ebullient staff greet me warmly at breakfast, placing my Americano on my table while I do a first sweep of the buffet. 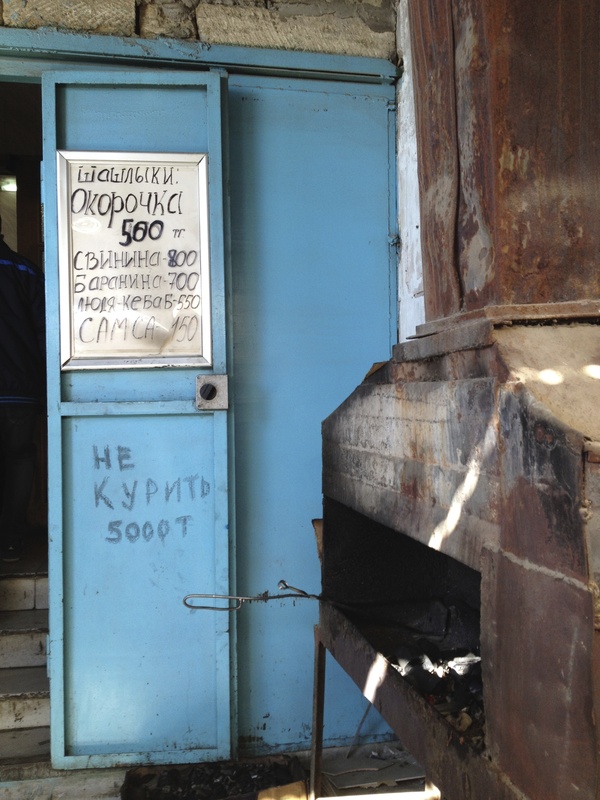 Miroslav, the chef calls out to ask if I’d like an omelette…”pazahal’sta, just a malinky,” I reply using my favourite Russian word meaning small. The odd day, there might be the distraction of an unfamiliar guest to chat with. Today it was a lovely, and understandably jet-lagged American lady here to attend a wedding this weekend. I tip my hat to her as it’s an awful long way to come for a celebration. I have a feeling she hid her surprise when I told her I actually lived here. It does catch a few people off guard, including myself occasionally. And it’s interesting, even intriguing with a revolving door of different people and fascinating conversations. Going down for a cocktail or two and buzzing back up to the top floor is darn cool. The staff feel like family, I was welcomed back with hugs and genuine warmth. But there I was yesterday, feeling restless, feeling confined. The suite had been cleaned while I had breakfast. My quick stint at the gym was lacklustre. A short walk to the grocers garnered some much needed vitamin D and my two phrases of Russian elicited some carrots and wilted coriander. Back along the rutted sidewalk to the hotel, outing complete. 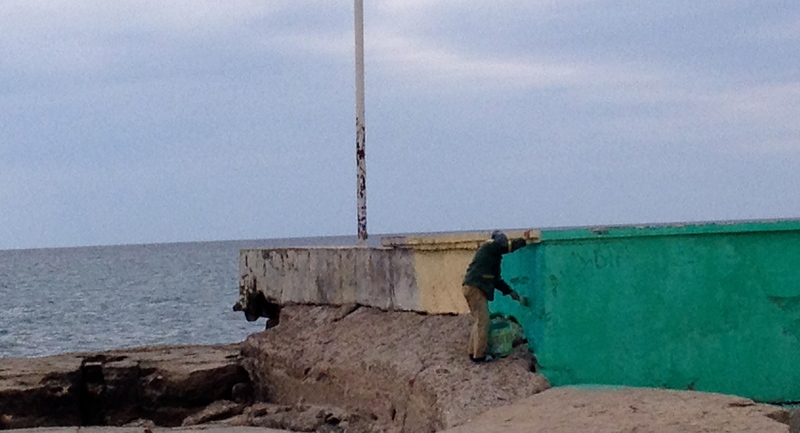 Not one photo snapped, not one interesting exchange, not even a glance out to the sea. As the elevator doors closed on me, I slipped back into the doldrums. Trying to be productive, I washed our seven dishes from lunch…yes B. comes home for lunch every day, usually just when I’m caught up in my work and would rather not be disturbed. Continuing with my predictable days, I know that the very efficient Amangul will deliver our laundry at 4:30 and trust me, I longed to have this respite from housework and chores once again. But there is something fulfilling about a gleaming floor and dust free blinds when they’re the fruits of your own labour. No, the laundry I will never miss. And yes I admit that crawling into pristine sheets every evening is, well…sublime. Snap back to that restless afternoon, time is crawling by. I’m procrastinating, I have a writer’s bio to complete for some newly published work and I’m designing a writer’s workshop that I should start on. Instead, I stare absent mindedly out the window…Oh how I wish I could open it. The view of the Caspian from our suite is usually what inspires me. Today it’s almost monochromatic; the sea and sky melding into one dun, formless canvas. Seemingly in a hypnotic trance, I fixate on the busy intersection from our upper window, watching the cars scurry below. 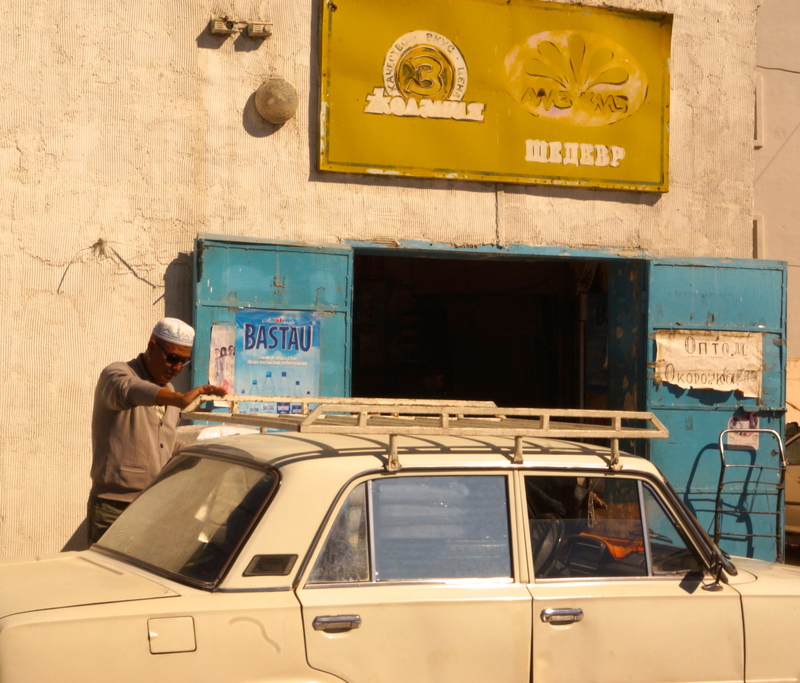 I start counting Ladas, those ubiquitous toy- like cars left over the Soviet days. Hmm, seems there’s about one every twenty cars..yes, seems they’re all still white. This is rather ridiculous, get on with something, I chide myself. Then something registers against the drab skyline. 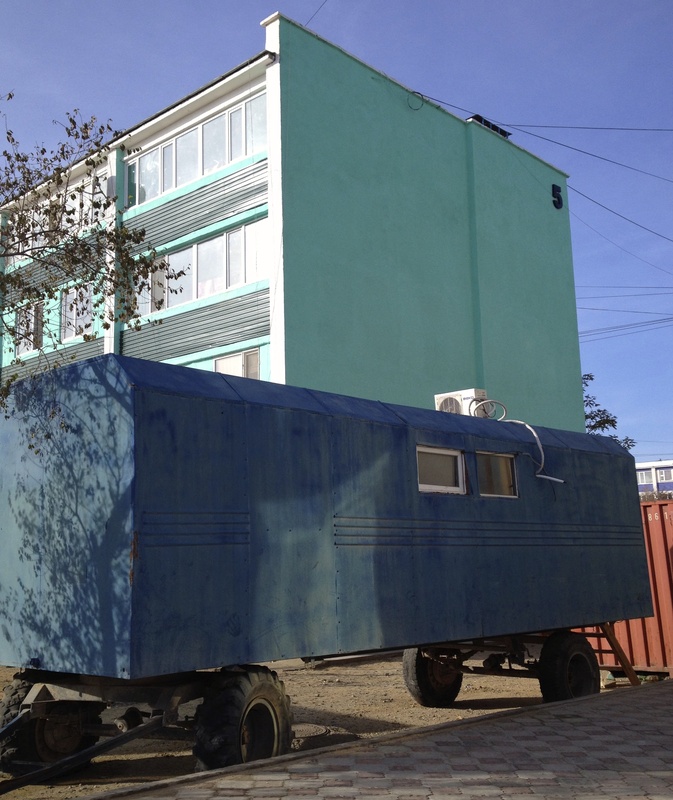 I suddenly get these ‘Soviet style’ buildings across the street and down the streets…those with no names. 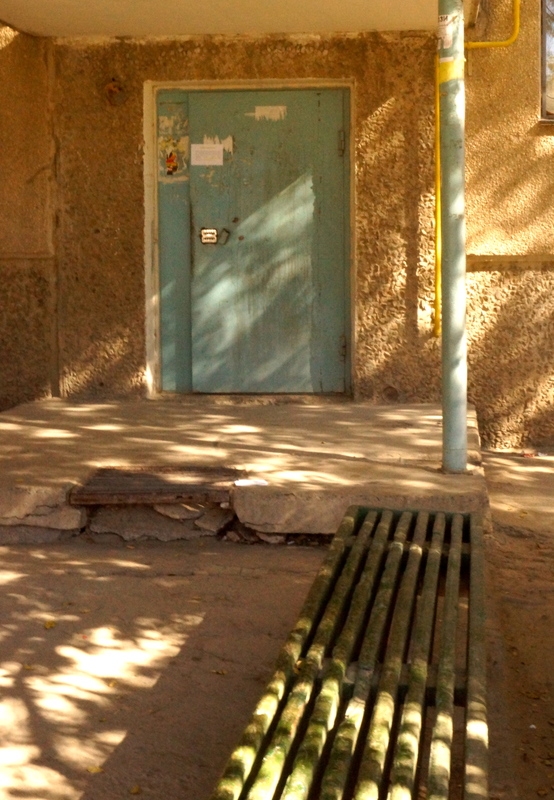 I understand their garish colours and the slathers of paint on the low, crumbling concrete walls. Some relief, some colour against this drab February setting. I recall pondering this when we were out in the warmth of the October sun… the fact that so much of the city is hued in blue and green. 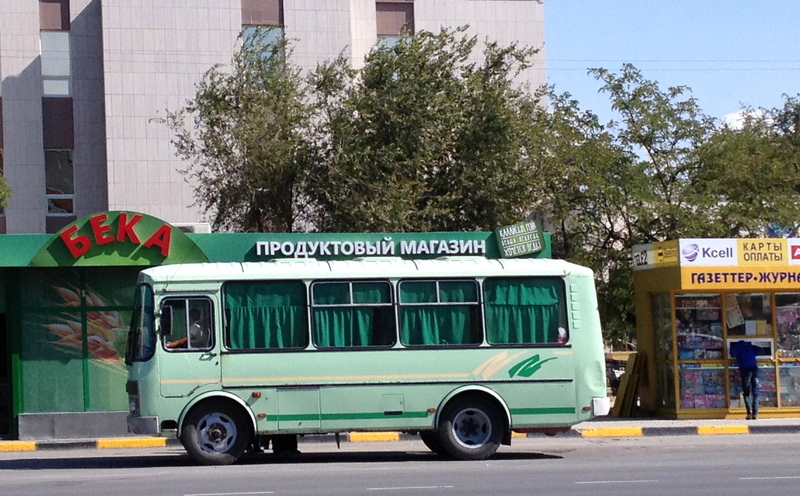 Do they have a warehouse full of that pesky green shade left over from Soviet times that will be used until eternity. The blue I like! Blue, along with that sickly shade of hospital green dominate the colour scheme; at the markets, on signs, on flower pots and buildings. On buses, benches and especially doors. I sense it isn’t by chance. In this part of the world, blue is a colour steeped in tradition and of religious significance. To the Turkic people, as with Kazakhs, it symbolizes cultural and ethnic unity. It also represents the endless sky, as well as precious water (not to mention the colour of the Kazakh flag.) 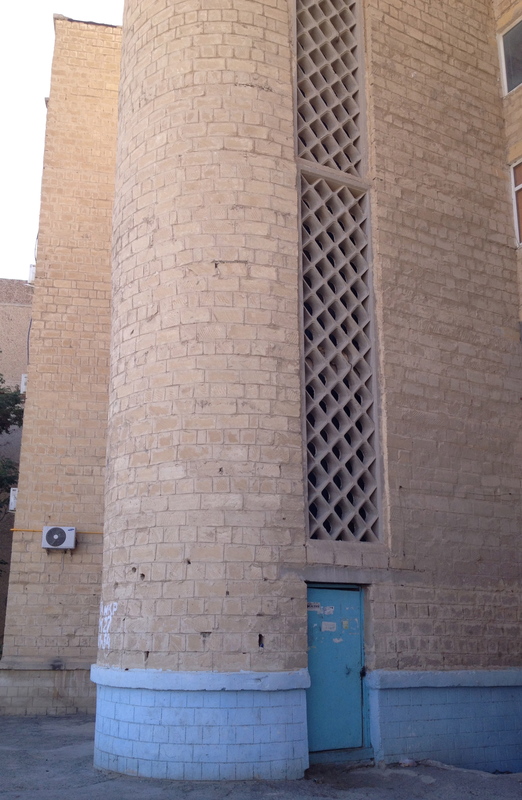 Yes, this light blue colour is meant to signify health, healing and as a bonus…it wards off evil spirits. Perhaps why it graces so many doors? So, I finally rally and go to my photos that are resplendent with these two shades. There is no end to the photos I took when I arrived, it must have been that beguiling honeymoon phase. Looking at them now has cheered me, revived me…and at least I’m no longer counting Ladas! By the way,there is a shade on the colour wheel for this sickly green… (#94b21c) …the supposed healing properties of the light blue is a lovely antidote for it after all, it seems. And it appears we need to chat about a trip being planned to Azerbaijan. It’s supposed to be a must see…I know, who would have thought it. I’ll keep you posted! 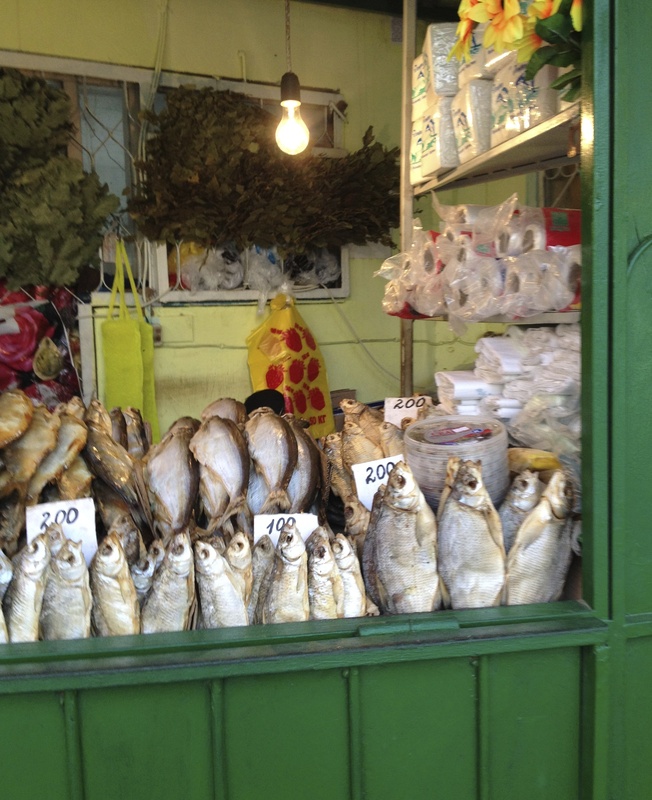 I’m on a long meander back to Kazakhstan…Calgary, Toronto, Istanbul, Almaty and finally two calendar days later, Aktau. And so I found myself spending time in Istanbul, an ancient city I hadn’t yet explored but one which had always intrigued me. How could this great Byzantine city, long known as Constantinople, not be fascinating? Constantine the Great moved his empire here from Rome in 330 A.D.; the city was then already 1000 years old. Now it’s just good old Istanbul, meaning ‘to the city’, but I admit to a certain delightful bewilderment knowing I’m in the once…Constantinople. It’s positioned along the Bosphorus river and has long conjured romantic images; of Sultans and their harems, of steamy Turkish hamams, of exotic spices and dazzling architecture. Despite those temptations, as the plane touched down this morning after an over-night flight, it crossed my mind to just languish at the airport for the day. Along with being travel-weary it was rainy and cold, yet this great city at the crossroads of Europe and Asia beckoned; its marvels and mysteries calling to me as it has to travellers for the past 2000 years. 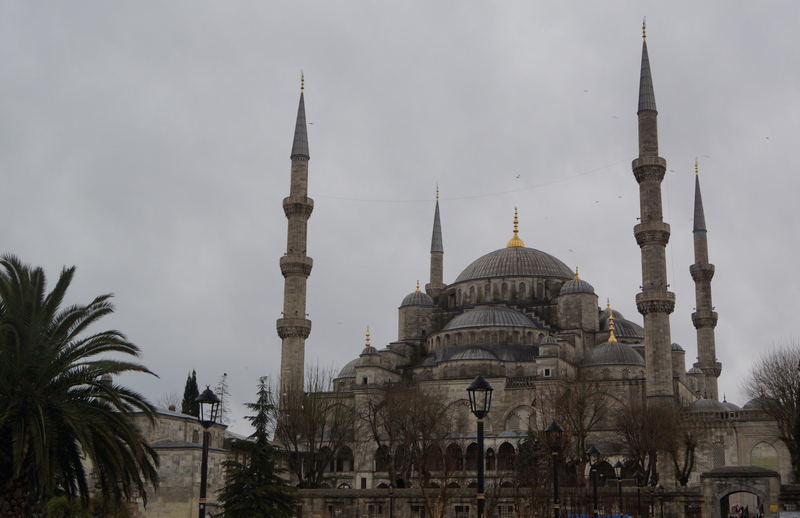 As the tram* rattled its way to Sultanahmet, the old city, I was delighted when the famed Blue Mosque and Hagia Sophia came into view, their minarets majestically piercing the brooding Turkish sky. I wouldn’t explore those iconic sights today, I’d leave them for our return here in seven weeks during a proper stay. 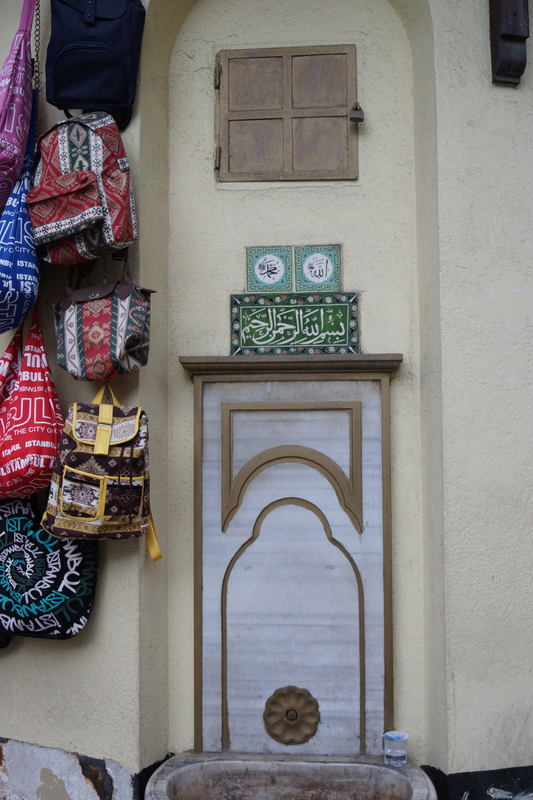 For now, I found myself relishing vivid street scenes; a rainbow of colour from hand woven carpets, vibrant displays of teas and spices, glass lanterns, to endless mounds of baklava and Turkish Delight. Needing a respite from both airline food and the rain, I ducked into what looked to be a typical Turkish restaurant. Tiled walls, flat bread blistering on an open oven, carpets hanging splendidly and best of all, dolmas; delicious, delicate morsels wrapped in grape leaves. It all greeted me, as did the welcoming owner, ushering me to a seat with a view to the ‘bread maker’. How did you even consider staying at the airport? You wouldn’t be eating some of your favourite food right now, nor would you have anything to write about, what were you thinking? “Madam must finish with Turkish tea”, the affable waiter informed me after I was more than sated. He positioned a delicate cup in front of me before I had a chance to reply. “No charge, it’s from him,” he said, motioning with a tip of his head towards the friendly chef standing between his grill and a counter lavishly displayed with food. “Sağ olun,” I countered with a smile and nod, pleased I had remembered the more informal thank you, as when someone has gone out of their way to do something for you. Besides, it’s far easier to pronounce than teşekkür ederim, that more proper thank you. I soon found myself in that one place any traveler must experience if you want to breathe the history of this city. 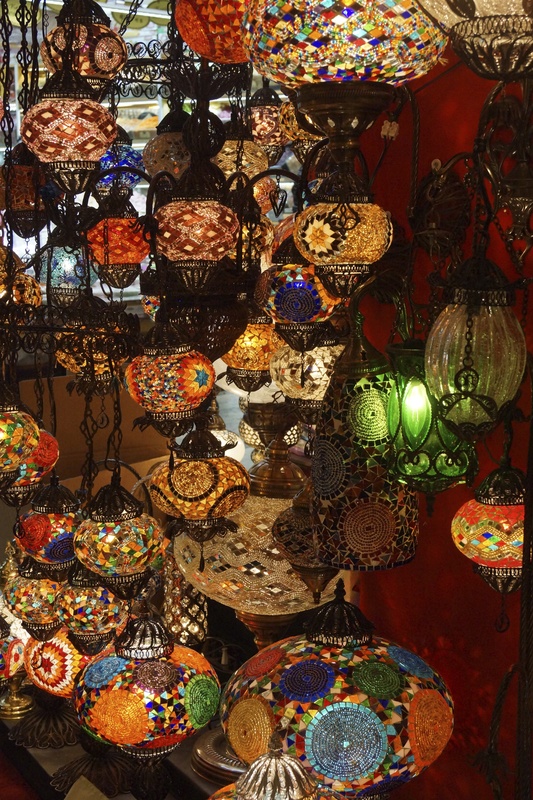 Simply, one must disappear into the Grand Bazaar. 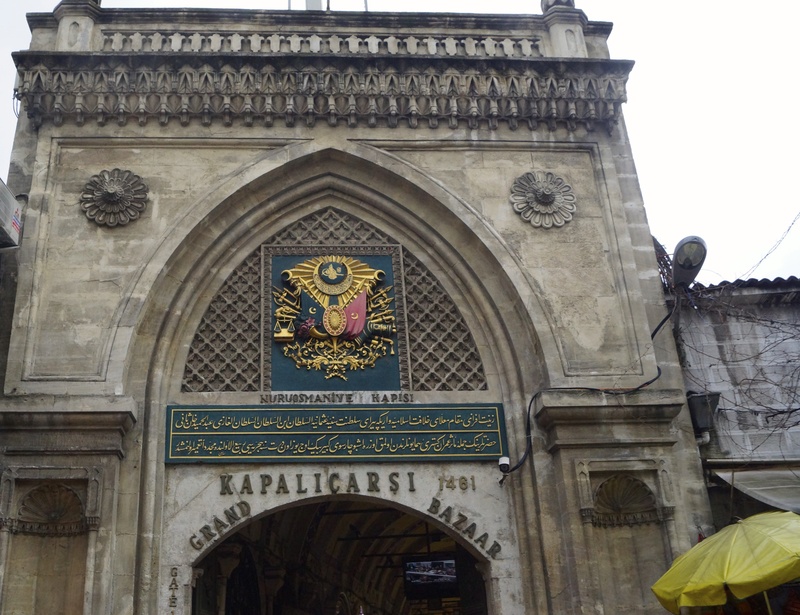 The building of the Kapali Carsi began in the winter of 1455, after the Ottoman conquest of Constantinople by Sultan Mehmet. European travellers as far back as the 1600’s brought home news of the bazaar’s unrivalled abundance of goods and exotic atmosphere. Tales that often became the subject of romantic literature. 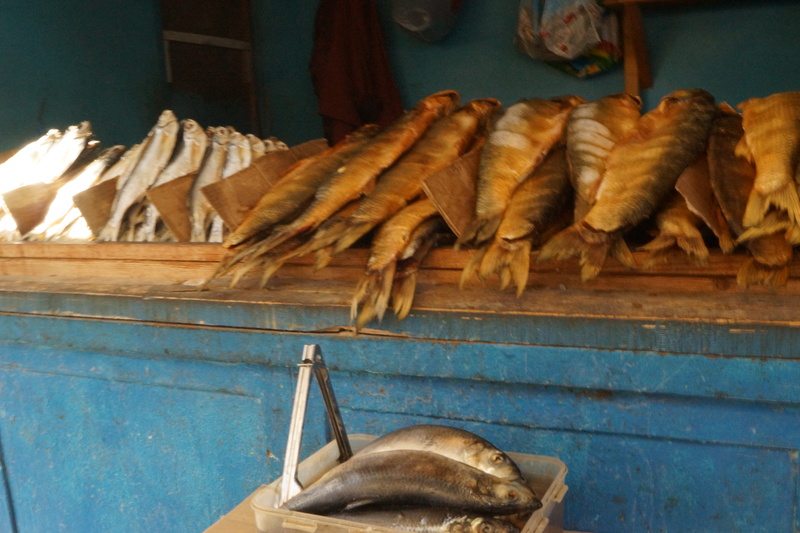 Originally 67 roads wove the bazaar together, each bearing the name of the type of goods found there. The maze, where time seems to stand still, once housed squares, mosques, fountains and 18 gates that were locked in the evenings. However, this seemed superfluous as theft was unheard of, though an incident in 1591 rattled Instanbul to the core when a substantial quantity of gold disappeared in the bazaar. This prompted a closure for two weeks until the culprit, a young seller of musk, was found. Not, however, before a number of tortures had been carried out. Ironically the Sultan spared the theif from torture, but not execution. Other tales abound from those days as the social dictates didn’t allow women to frequent the bazaar, but perhaps a few disguised themselves and made their way in? Apparently one of the Sultans did just this, but as an excuse to eat his favourite pudding. 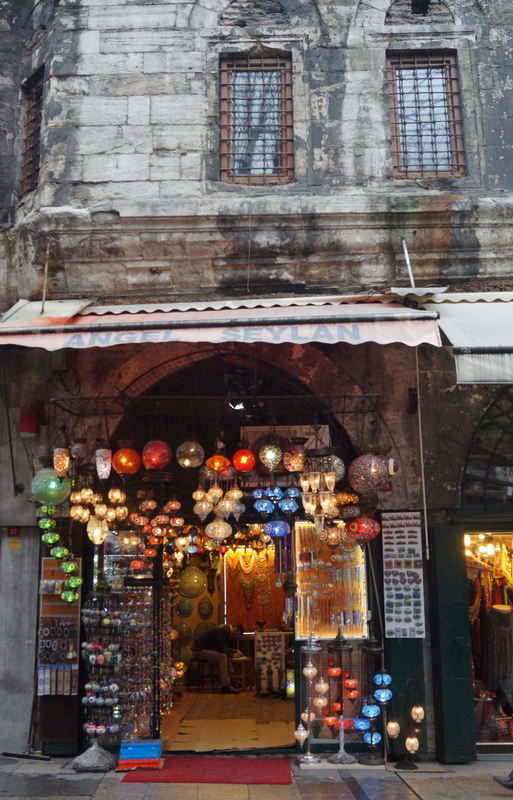 Nowadays, the Grand Bazaar houses more than 3,000 shops in its 62 lanes, employing some 26,000 people. 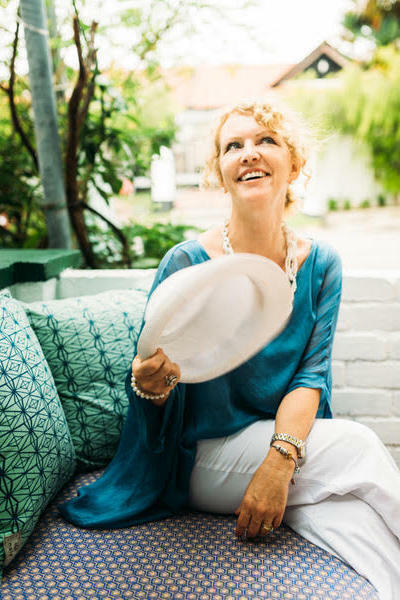 Each dolap or stall is replete with a sense of history as it sells beautiful ceramics, carpets and cushions, resplendent fabrics, intricately wrought metal, delicate stained-glass lanterns, and of course tea. I note the mix of nationalities and languages, musing that Sultan Mehmet would surely be pleased as he had urged the return of those who had fled the city during the siege of the Ottomans, wishing to resettle Muslims, Jews and Christians as one. 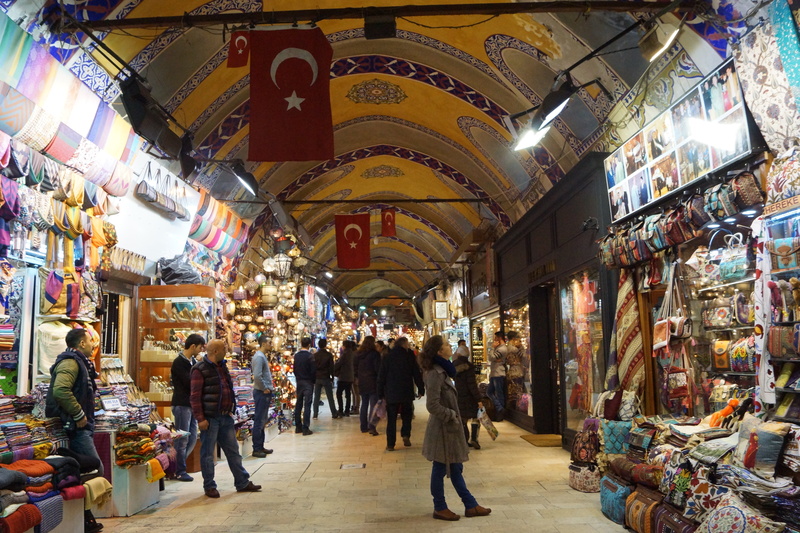 All part of creating a cohesive, cosmopolitan society and the Grand Bazaar is enduring proof of this. Pausing to take a photo of a grouping of tea cups, I was reminded I had seen çaycı or ‘tea runners’ out on the street, moving deftly through the crowds delivering the piping hot cups of sustenance to shop keepers, a scene unchanged through the centuries. Admiring the glass lanterns surrounding the tray, I was approached by the shopkeeper, his gentle tone was a welcome change from the persistent urging that I’d experienced throughout the day. “Where are you from,” is how it always starts, a prelude to the inevitable question as to whether you wish to buy a carpet. Falling into an easy conversation, he introduced himself as Recep as I admired the lanterns and candle holders in the cozy dolap. Eyeing a small holder off in the corner, I envisioned it on my desk, its mosaic of deep turquoise glass encased in white instantly captivating me. Yet, despite the brilliance of the glowing lanterns, I ruefully admitted I couldn’t I couldn’t carry anything that large. “Please stay, we’ll have tea,” Recep said kindly. 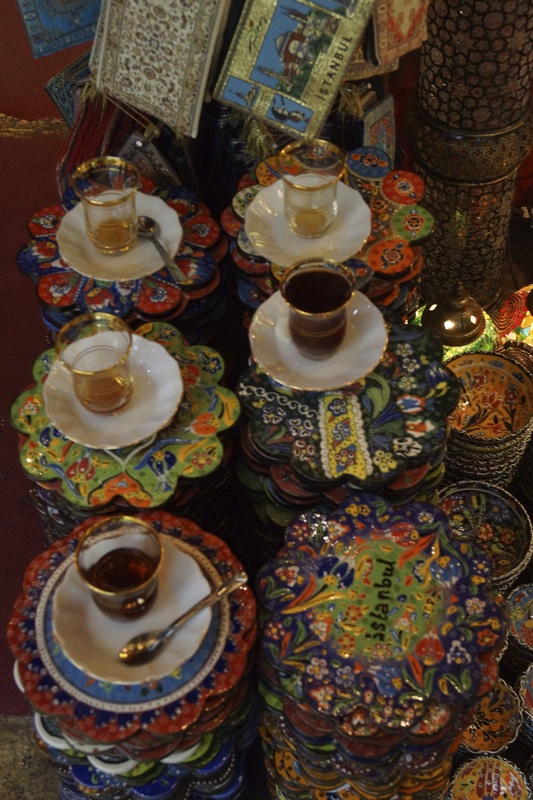 I was taken aback yet delighted as I know tea is an intregal aspect of Turkish culture and hospitality. After a quick phone call across the lane on a central phone, tea arrived two minutes later. Delivered on a small tray with a triangular handle, the çaycı nodded politely as he handed me the tiny cup and saucer, the same I had admired throughout the day in countless shop windows. As we chat, Recep tells me about the business he’s built from the ground up and I comment that it must be difficult with so much competition, considering the endless shops in the maze surrounding me. “No,” he assures me, “there’s enough for everyone if business is done well.” I believe at this point I ‘toast’ him with my delicate tulip shaped tea cup, so ubiquitous in Turkish life that it is often used as a measurement in recipes. And of the tea, apparently Turkey leads the world in per capita consumption of tea, it’s strong and delicious. Here it’s never served with milk and in the Eastern part of the country it’s common to place a sugar cube under the tongue before sipping the tea from the glass. I’ve ‘declined’ the three cubes on my tiny saucer, but thankful I didn’t refuse the kind gesture of being offered tea in the Grand Bazaar. “There’s no price for you, my gift.” Sağ olun was again my heartfelt response. After a warm hand shake, I parted from my new friend and navigated my way out into the brisk air. I hear “Where are you from miss?” yet again and this time decide to just go with it. 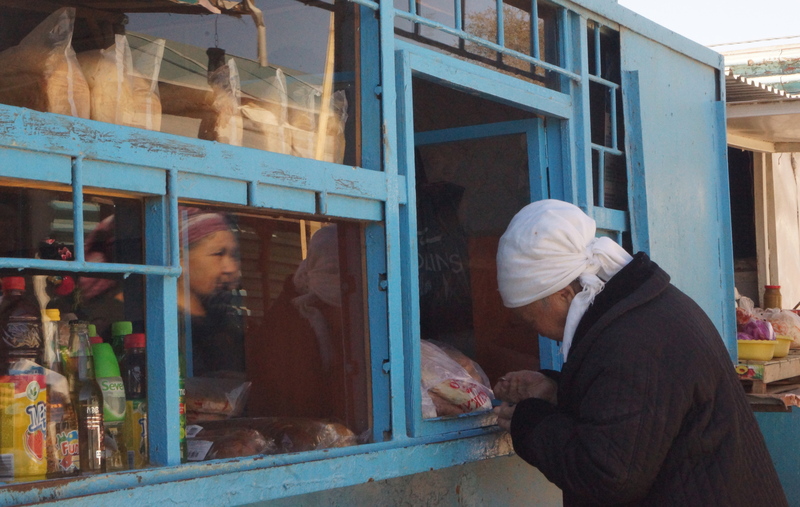 Turns out he’s selling those aforementioned treats…surely I should buy some. Who comes to Turkey and doesn’t buy Turkish Delight after all? By this time it’s rush hour and I join the commuters on the tram, at once appreciating their kindness. Some enquire if I need help, did I know the way? Others notice the city map in my hand and smile. Beneath the exotic facades and arguably daunting perceptions that recent events have wrought here, a familiar fabric of life prevails. People making their way home looked relieved to reach the end of their working day, yet gladly offered their seats to the elderly. Sweethearts whispered in each other’s ears, parents pecked their children on the cheek as they held them closely in the squash of people. 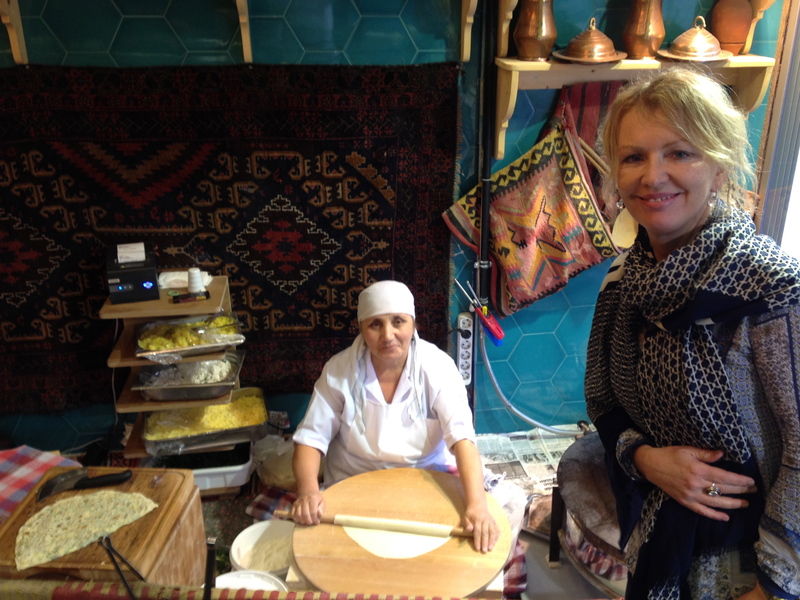 I loved the Turkish people; I felt welcomed, I felt at home. I so look forward to returning and we shall try to drop in to see Recep, that is if I can find that stall again out of the 3000 or so! Actually, its Takkeciler No. 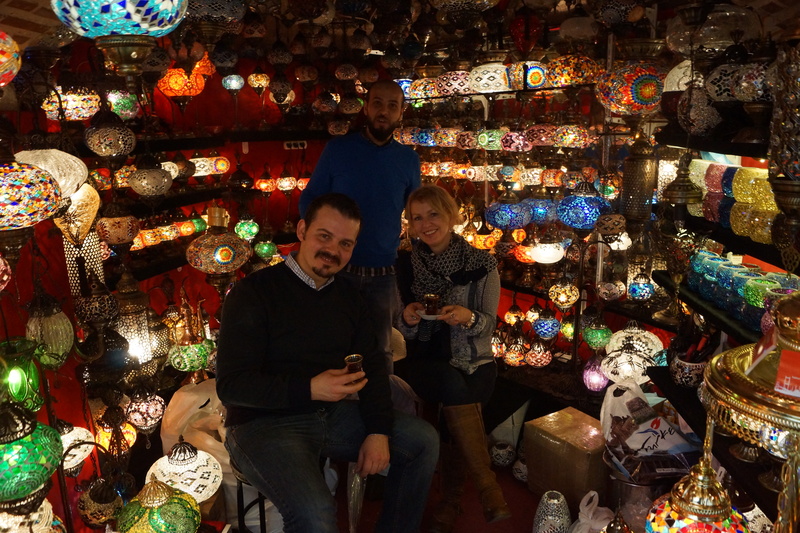 7 Kapali Carsi -Beyazit…just in case you find yourself there and want a Turkish lantern (I know I still do) and maybe a spot of tea. Tell him Terry Anne sent you!